Ensure that the pumpkin is well-drained. Beat eggs and add to pumpkin and mix. Add the rest of the of the ingredients, except for the oil and cinnamon sugar. Mix well into a thick batter. Heat a heavy pan, using medium to high heat to start with. Add a little oil. Scoop up heaped tablespoons of batter, and drop into pan, but not too close together. Fry until bubbles form on the top surface. They should now be firm and golden on the underside. Flip over and fry on other side. The fritters will puff up slightly while cooking. To test, press lightly on the fritters. When done, they will tend to spring back. Remove from pan and drain on kitchen paper. Serve warm with plenty of crunchy cinnamon-flavoured sugar. ENJOY….I PROMISE YOU’LL COME BACK FOR MORE!! This entry was posted on June 28, 2010 at 9:28 am and is filed under Cooking, Family, Friends, Life, People, Personal, Random, Recipe with tags baking powder, cinnamon, eggs, Fritter, lemon juice, pumpkin, recipe, sugar. You can follow any responses to this entry through the RSS 2.0 feed. You can leave a response, or trackback from your own site. I am going to make some tonight. YUM. Thanks for sharing the recipe. 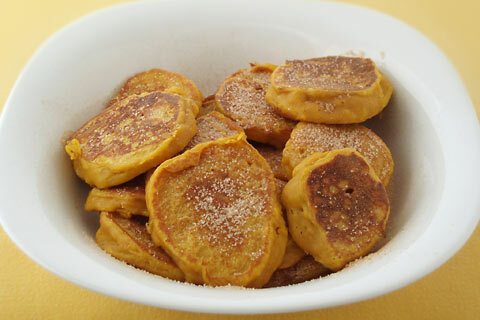 I LOVE pumpkin and I am going to go buy a can of it tomorrow so I can make these…what a perfect breakfast food to go with my morning coffee! YUM!